Snorkeling is an activity that can be fun for adults and children alike, but the equipment can vary quite a bit. When buying equipment for an adult, you don’t have to account for any further growth. So, when looking at equipment for children, you have to keep that in mind that children are smaller and still growing. You’ll want to ensure that you get the equipment that is the most comfortable for your child so that they fully enjoy their experience. There’s nothing worse than a leaky mask ruining a perfectly good snorkeling experience. But, fear not, you don’t actually have to get the most expensive equipment in order to get high-quality gear. After all, they’ll just outgrow it very quickly. We’ve compiled a list of the five best snorkeling gear sets for kids on the market currently. We’ve also included a buying guide to ensure that you know exactly what you need to get for your child. NAGA is a well-known and reputable company that is known for producing top quality snorkeling gear, which this being no exception. The mask included is fitted with tempered glass which helps to make it durable and strong. The anti-fog built-in system ensures that your child gets the best view possible while underwater. It is shatter resistant and scratch resistant, however, we did see a few reports of it breaking if dropped on hard surfaces. The lens is a single system design which gives them uninterrupted views. 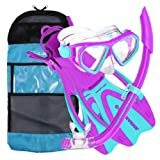 It is a great compact option, which makes it ideal for those who love to take snorkeling equipment with them while traveling. The included quick-drying mesh bag enables you to organize your equipment in one place. Its portable size is great for getting the most use. It comes with a 90-day money back guarantee and a 1-year warranty. This snorkel combo set by U.S. Divers includes everything that your child will need to get kickstarted on their snorkeling adventures. The set includes a set of proflex fins that offer your child with the flexibility, movement, and comfortability that they need in the ocean. The splash guard equipped onto the snorkel barrel is great at preventing water from getting into the snorkel. Your children will also find the pocket of the fins very comfortable to wear. The snorkel is ideal for children that have narrower faces. The dry top snorkel is equipped with a pivot dry technology, which keeps the water out while also being submersible. It is available in a variety of colors and sizes. The combo set also comes complete with a mesh bag that is really helpful in keeping all of their gear in one place, which is great when traveling and packing. This snorkel set by Cressi combines affordability and quality perfectly. It features a tough tempered glass lens mask that offers you a product with durability. The mask also has adjustable buckles, which help to ensure a perfect fit. The snorkel includes a splash guard that is great underwater as it prevents water from entering the tube, allowing your child to breathe safely and easily underwater. The fins are easy to use and short, but still deliver power with every kick, allowing your child to focus more on the water. The fin is designed with an open heel design that includes an adjustable strap that allows it to grow with your child. The set comes complete with a mesh bag that is great for holding all of their gear together, which is great for organization and traveling. This set features a Laguna snorkel and a regal mask, which means that it has a slightly larger and wider skirt. The snorkel is completely submersible through the dry top snorkel. The skirt is made with hypoallergenic silicone to give a good seal and comfort. The quick release buckles on the straps make it easy for even your child to adjust. The fins are small, which makes them easily packable while allowing flexibility, power, and smoothness underwater. The broad age range does mean that some feet might not fit in the foot pocket. It also includes a carry bag that allows you to easily place everything together which is great while traveling. It also encourages children to carry their own equipment. It comes in a variety of sizes and colors for you to choose from. Mis-sized foot pockets – If your child has smaller feet, then their feet might not reach the foot pockets end. If your child has larger feet, then they might extend beyond the pocket. Promate is a trusted brand, so it’s no surprise that this is a quality set. The mask skirt is made of comfortable and soft silicone in a design that pushes any bubbles away from the viewing area. The snorkel is said to be a 100% dry snorkel, but we did notice a few leaks when we tested it. The fins have an open heel design and are made with soft rubber that makes it comfortable for small and growing feet. The snorkel combo set is a reliable and safe set that is great for any child. It comes in two options with the first one including a mask, fins, snorkel, and mesh bag OR a mask, fins, snorkel, snorkel vest, and mesh bag. It comes in two sizes, small to medium and large to extra-large. It also comes in three colors choices for both of the combo options. The fins are great whether you want to go barefoot for some pool time or with booties for snorkeling. The goggles are prone to fogging up, but these goggles are not advertised to be anti-fogging. There are a few key components of a snorkel set, which include the mask, the snorkel, and the fins. There are also a few optional, but recommended tools, such as a wetsuit and snorkel vest. When looking to purchase a set that includes all three of these, you’ll need to keep a lookout for a few important aspects. The difference between a good snorkeling experience and a bad snorkeling experience can be just from having a good quality snorkel mask. A high-quality mask will fit your child’s face snuggly and prevent any leaks from occurring with a tight seal. In order to ensure this, it is recommended that you try out the mask on your child before purchasing it. If you get a chance to do this, ensure to check the skirt of the mask, which is the rubber around the mask, for any leaks as well as the fit. You should look for masks that have defogging features as it will help to keep your child’s lens clear. This will reduce any fussiness underwater regarding the loss of clear view. In order to see if the mask fits properly, place the mask on their face and stop it as it barely touches their face. The mask should touch all parts of their face at the same time. There shouldn’t be any gaps between the skin and the skirt. Pay close attention to the corners of the mouth and nose as those are the places that are most common for leaks. The snorkel is another one of the important aspects of the kit as it’s the equipment that allows your child to breathe underwater. When looking at a snorkeling combo set, it’s important to ensure that the snorkel is the right size for your child. This is due to many companies making snorkels that are too big for certain kids, which doesn’t allow a firm bite. A well-fitting snorkel is important as it’s the piece of equipment that keeps water out of their mouth. You might also want to consider purchasing a purge snorkel, which just enables your child to push out any water that accidentally makes it in. Another option is to purchase a dry snorkel, which keeps the water out completely. The recommended type of snorkel is, of course, the dry top snorkel as it ensures that no water can get into the tube. This will reduce any risk of choking on water and thus expanding your child’s snorkel experience. Without fins, you’ll find yourself lacking speed underwater, which is why they are considered an important piece of your snorkeling set. Sizing is very important with fins. Your child’s foot will be continually growing, which means that they might quickly outgrow their fins. This is why you should pick fins that aren’t too tight or too loose. You might also want to consider the fins flexibility, as the more rigid ones will help your child to move along faster, but flexible fins might be better for beginner snorkelers. This is a recommended gear as it will help to keep your child warm, which will then enable them to stay underwater for longer periods of time in comparison to just a swimsuit. You should ensure that the wetsuit fits properly by ensuring that the fit is snug around their neck, arms, and legs. This will help to keep any water out of the suit. Depending on their swimming abilities, a snorkel vest could be necessary to include within their snorkeling gear. A vest can be helpful in keeping them afloat without much effort on their part which helps them see underwater sights. This also helps to keep them relaxed as it is a buoyancy device. Most snorkel vests also come in highly visible colors, which helps to spot them from a distance. If you are planning on traveling by a snorkel tour boat, then most do recommend that your child wear a vest.